If you have children, you’ll hear “I’m bored” several times this summer. To combat that boredom, keep a list of ideas that will get them excited and keep them occupied, from outdoor games to rainy-day activities. 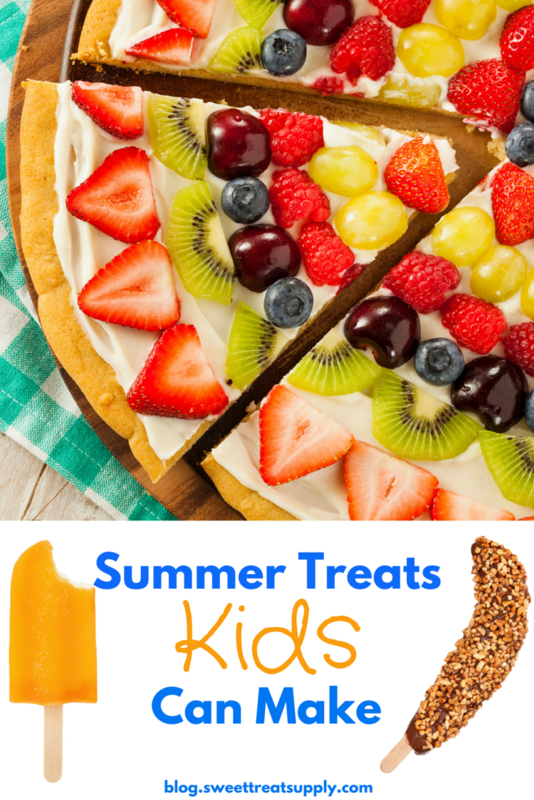 One fun way to keep kids involved this summer, especially they’re stuck inside, is to get them involved in making treats. They’ll have something fun to do, with the added bonus of a snack-time treat. 2. Cookies: If it’s not too hot to use the oven, shaped cookies are always fun. The cookie cutter section of our store has a large selection of cookie cutters to fit any interest, from spiders and ball caps to teddy bears and bunnies. Kids love using cookie cutters to press out their favorite shapes, and they’ll especially enjoy getting to choose what shapes you use each time you bake together. There are even letters and numbers, so your little ones could turn snack time into learning time. 3. Frozen Bananas: Another healthy treat is homemade frozen bananas. Our online store is a great source for the sticks and melting chocolates — just supply the bananas. First, insert a stick into a ripe (but not too ripe) banana and freeze for an hour. For toppings, you can roll in melted chocolate and then nuts or sprinkles, or use marshmallow fluff or sundae toppings. Return to the freezer until hardened. 4. Fruit Pizzas: Whip some cream cheese with a little sugar and vanilla, spread on a sugar cookie, and add sliced fruit. Best of all, the customization possibilities are endless. Make a family-sized pizza or let everyone create a personal pizza. Experiment with brownie crust or other cookie flavors. Fruit suggestions include strawberries, kiwi, blueberries, raspberries and mandarin oranges. Have fun creating and eating this summer! What are your kids’ favorite treats to make during the summer? Leave us a comment and let us know!